A universe on the wrist: there is simply no other way to describe the Astronomia by Jacob & Co. This watch is a testimony to the development of watchmaking, not as a practical science, but as a form of art. Yes, the Astronomia tells time. But that becomes a mere detail lost in the visual impact that this watch provides. With a diameter of 50 mm, the Astronomia Tourbillon Baguette is a generously sized watch. Where other watches might be harshly judged by a diameter of this size, the Astronomia uses all this space to create a visual splendor that is, even in today’s world of wild watches, quite unique. I dare say that Jacob & Co should even be lauded for in fact creating this unique timekeeper as a fairly easy wristwatch to wear, rather than opting to turn it into an elaborate clock. I have had the privilege of wearing the Astronomia and found the watch very balanced on the wrist. It could indeed become a daily-wear watch if it weren’t for the fact that at a thickness of 25 mm it does not easily slip under the cuff of your shirt. This is however a triviality that can easily be solved by visiting your tailor for a few new custom-made shirts . . . or by forgoing sleeves altogether. The Astronomia is a watch to see, admire, and, yes, to be seen with. Jacob Arabo, the brand’s founder, knows this all too well, creating the case of the Astronomia more as a frame holding sapphire viewports along the side of the watch. This and the high domed sapphire crystal on top allow you to see the movement from a wide variety of different angles, leaving you unsure as to which angle shows off the movement at its most impressive. Without angles, the high domed crystal is virtually invisible and the watch does not look as high as the statistics indicate. Despite the fact that most of the movement is in fact visible, your brain does not make the connection. It might be the distraction of all the different complications or the realization that you have something very special and precious on your wrist. What makes this watch even more special is not that it is fitted with a triple-axis tourbillon, but that the triple-axis tourbillon is not the centerpiece of this watch. In fact, it is actually quite unclear what the centerpiece of this watch might be. 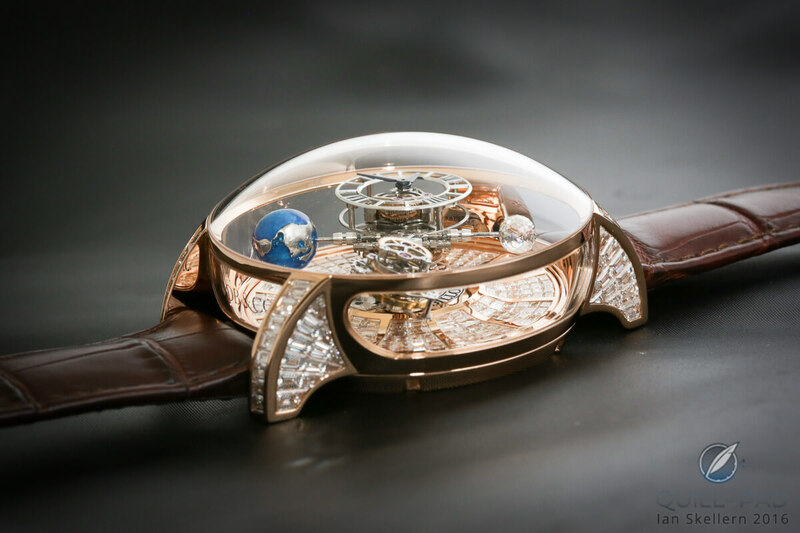 Is it the tourbillon or the spherical-cut diamond representing the moon? Or is it the counter-balancing lacquered magnesium globe opposite that diamond moon? Let’s also not forget the most practical part of this watch: the small dial displaying the hour and minute that moves around the watch, always remaining upright so it can instantly be read. The watch is full of movement in both meanings of the term: the tourbillon revolves in 60 seconds around its first axis, takes 5 minutes for the second axis, and turns the whole movement around in 20 minutes. The globe and diamond moon both turn around their axes in 60 seconds, while the indication dial orbits the center axis in 20 minutes. From these numbers, you can already tell that the Astronomia only shows the time. It does not tell you the current moon phase nor does it utilize the globe to provide world time in a complicated way. That might disappoint some, but it also gave Jacob & Co much more artistic freedom, an opportunity that the brand seized. Creating a visual spectacle was the primary objective. The winding and setting mechanism is on the back of the watch, so there are no crowns interfering with the beautiful case design. This is a tour de force since the stones also lean slightly upward near the center of the dial. The same can be said for the setting of the diamonds on the lugs, especially the sides where the stones are placed in a fan shape, once again invisibly set. Known as “Jacob the Jeweler,” Arabo has a reputation to uphold when it comes to diamonds; therefore these are of the highest quality: Top Wesselton and Internally Flawless (IF) to Very Very Small Inclusions (VVS1). Normally, diamonds of such exceptional quality would be shown off in a white gold or platinum setting so that the color of the metal does not influence the colorless quality of the diamonds. However, by setting them in 18-karat pink gold as Arabo did, you get a stunning contrast that balances the diamonds in a much better way with the complications of the Astronomia’s technical appearance than a white precious metal would do. The only question remaining is whether the Astronomia belongs to the watchmaker’s or the jeweler’s universe. And to that, we can only answer: both! For more information, please visit www.jacobandco.com/timepieces/astronomia-clarity. Too mundane for my taste. I don’t like this watch. But it’s neither a watch, nor a piece of jewelry. I think it’s a work of art. Regarding its design, I don’t think it would be a successful watch if it would cost 200$. Yet, that’s what art should be in the first place: a piece of work that truly expresses the artist’s vision, and not just a banal object obeying all commercial standards. So, as a watch, I find it ugly and too flashy. As a work of art, it’s wonderful. Thank you for your well-considered opinion! Personnellement, je trouve que c’est une très belle montre. Etant horloger moi-même et ayant travaillé par le passé indirectement pour cette marque, je pense que c’est un peu trop facile de juger sur l’apparence d’une montre. Pensez aux multiples corps de métier qu’il aura fallu pour que cette montre voit le jour , à la complexité du mouvement qu’il a fallut monter-re-démonter, ajuster etc.. Et au sertisseur et enfin à l’horloger qui a du emboîter cette montre ! Donc, je penses qu’avant de juger un produit, il faudrait d’abord se demander : est-ce que je suis capable de faire mieux ou tout au plus , la même chose !